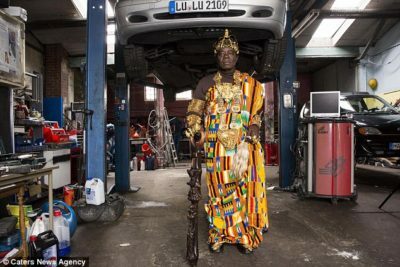 This is the African king who leads two very contrasting lives – as a part-time monarch and a full-time mechanic. 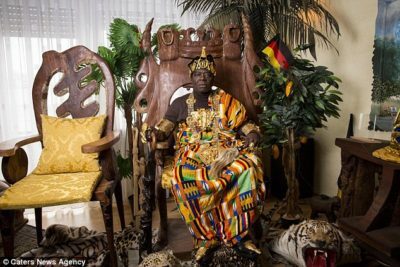 Dressed in all his royal finery, Céphas Bansah, helps to govern more than two million Ghanaian and Togolese people. 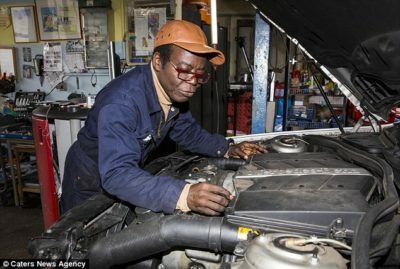 But despite being regarded as a ‘superior and spiritual chief of Ewe people’ in Togo, he also works full-time mechanic in Germany – governing his people over Skype. 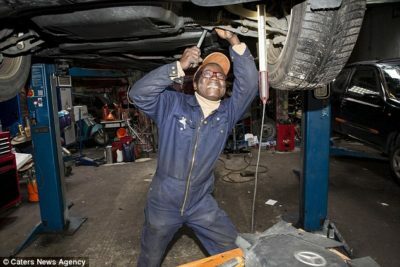 The 67-year-old’s official royal status is ‘King Togbe Ngoryifia Cephas Kosi Bansah’ – but he spends most of his time in oily overalls fixing cars. 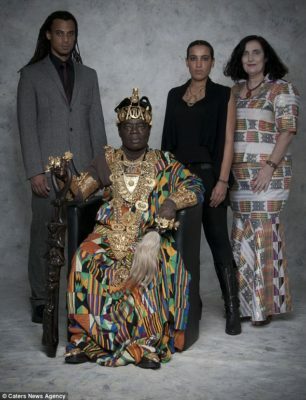 Céphas grew up in Ghana, he moved to Germany in 1970 before he was appointed king. His kingdom, Gbi in Eastern Ghana on the border of Togo, consists of 300,000 Ewe people. He originally moved to Germany when his grandfather, the then king, encouraged him to train there as a mechanic. After finishing his studies and gaining full citizenship, he settled and set up his own garage in Ludwigshafen. He continued living a peaceful life until 1987 – when he received a Fax which would change his life forever. 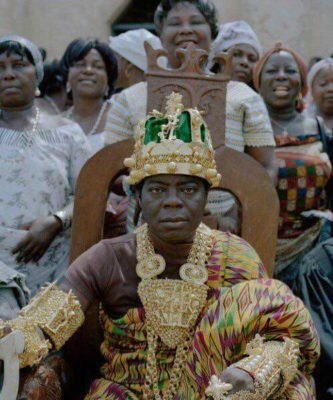 His grandfather, the King of Hohoe, had died and Bansah’s father and eldest brother were deemed unfit to rule because they were left-handed, which the Ewe people considered to be ‘unclean’. This meant that Céphas was his grandfather’s successor, and the new king. He now lives in Ludwigshafen with his wife Gabriele Bansah, 57 and his two children Carlo and Katharina, continuing his job as a mechanic and his role as King. He uses Skype to govern his people and still visits Ghana up to eight times per year. In his role as king he also works on a number of aid projects including building schools and is currently raising money to build a women’s prison. To fund his aid projects, Céphas also sells his own beer, called Akosombo – even though he never drinks alcohol himself. German photographer Christina Czybik spent the day with the king at his home and managed to capture a fascinating insight into his life. Christina said: ‘The mix of cultures is an interesting one. Bansah told me that the people in Ghana are very religious. ‘They are mostly Christian, but a lot are also Voodoo. But not in a bad way. ‘King Bansah has a small Voodoo shrine in his living room with a small handmade sign that reads ‘Michael Schumacher shall recover soon and fast’. 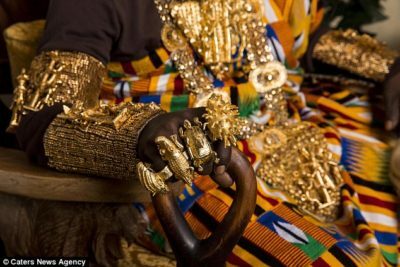 Even though Ghana is has a democratic system now, the traditional kings still have an important function within the communities as carers of their people.